Ven. Yeshe received her śrāmaṇerikā vows from Thrangu Rinpoche in the Kagyu lineage in October 2009 after spending a year at Gampo Abbey in Nova Scotia, Canada. She came to Sravasti Abbey from Denman Island, Vancouver BC for the first time in May, 2010 for monastic training. 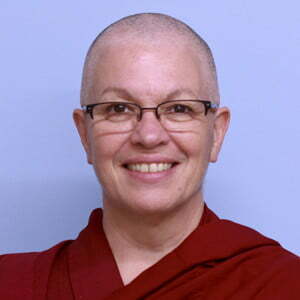 She returned to the Abbey in April 2011 and requested to join the Sravasti Abbey sangha. The community accepted her request, and Ven. 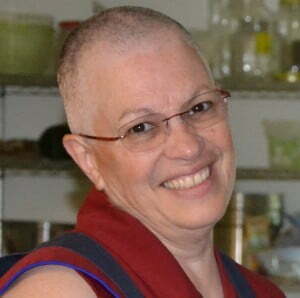 Yeshe received her śikṣamāṇā vows, the training ordination for nuns, in October 2011. See photos of her ordination. She received full bhikshuni ordination at Miao Fa Temple in Taiwan in 2013. Ven. Yeshe was formerly a military police officer in the Canadian Air Force, based on Vancouver Island, where she trained as an LPN beginning in 2002. She now spends much time bringing her skills to the Abbey kitchen and sewing room. She is also the resident organization expert, building shelves on every wall that can have them and bringing order to the growing buildings and community.